1. The water cooler unit should not be located in a position where sunlight can fall on the bottle. 2. Ensure all of your bottles are stored in a dry, cool and clean location out of the sunlight and not near chemical or fuel storage. 3. Your cooler should be cleaned at least quarterly. More often if you have a high consumption. 4. Never put anything in the bottles as this causes contamination. A fee of $22 is charged for contaminated bottles. 5. Any lost or damaged bottles incur a $22 replacement fee. 6. We offer a cleaning service of $44.00 per cooler. 1. Pottery and plastic dispensers shouldn’t be located in a position where sunlight can fall on the bottles. 3. Your dispenser should be cleaned at least once a month. 6. We offer a cleaning service of $44.00 per dispenser. 1. 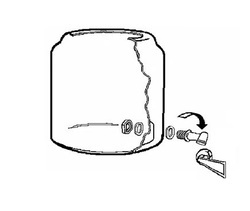 Assemble and disassemble the tap with the handle to the left. Also remove the handle of the tap by unscrewing it.